One of my main goals of my Adeptus Mechanicus army is that each Character mini be unique and while the Cybernetica Datasmith isn't an HQ choice, he is a Character and I really wanted him to be fancy. With that in mind, I decided to take a few liberties with the Datasmith model that comes with each Kastelan Robots kit and make him my own. For this one I used the original body and arms, as well as his front chest piece and backpack. The modifications include a Space Marine head and power fist. 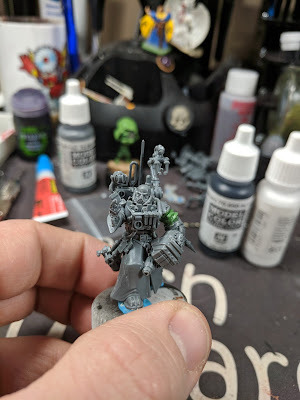 The power fist was cut off above the elbow and attached to the original shoulder of the Datasmith and covered in green stuff to recreate some of his sleeve. I also chopped off the skull adornment on the back of the power fist and added in a crux mechanicus from the original Datasmith power fist. 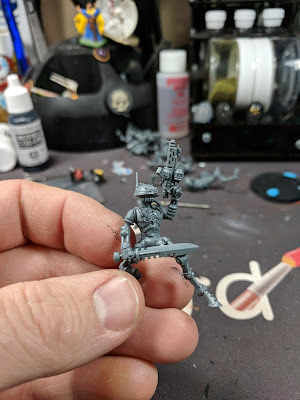 His right arm was modified using his original shoulder and a Skitarii Vanguard arm, which I had cut the rifle away from. I then used a spare datacard from the Kastelan kit to make it look as if he is holding one and getting ready to install it in a robot and change their protocols. I'm really pleased with him so far and hope to get started on painting him soon. For the army, I decided I needed to be able to surprise my foes a little easier, since Admech pretty much foot slogs from one side of the board. Enter the Sicarian Infiltrators. These fellas can be added to the board later in the game, as if they were laying in wait the entire time. This gives me a bit of ability to pincer attack my opponent and gives me a better chance to cover ground on the board. But, I really liked both of their weapon load outs and didn't want to pick between one or the other. Thanks to some magnets I had ordered for the Kastelan Robots, I was able to drill and mount some into the arms of the Sicarians too. This will allow me to swap between the power sword and gun combo seen here, to the taser goad and gun combo. Hopefully giving me a bit more bang for my buck and versatility. 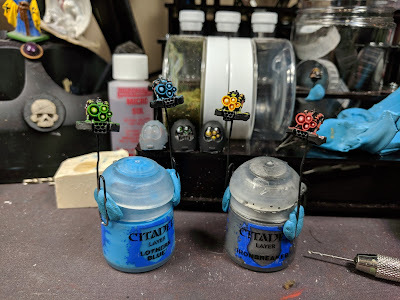 As I mentioned last week in my post about customizing the Kastelan Robot head, I am now in full swing and casting the four heads that will be used in the robots. It is a slow process and I needed to paint each head before casting them too. But it has been completely worth it so far. 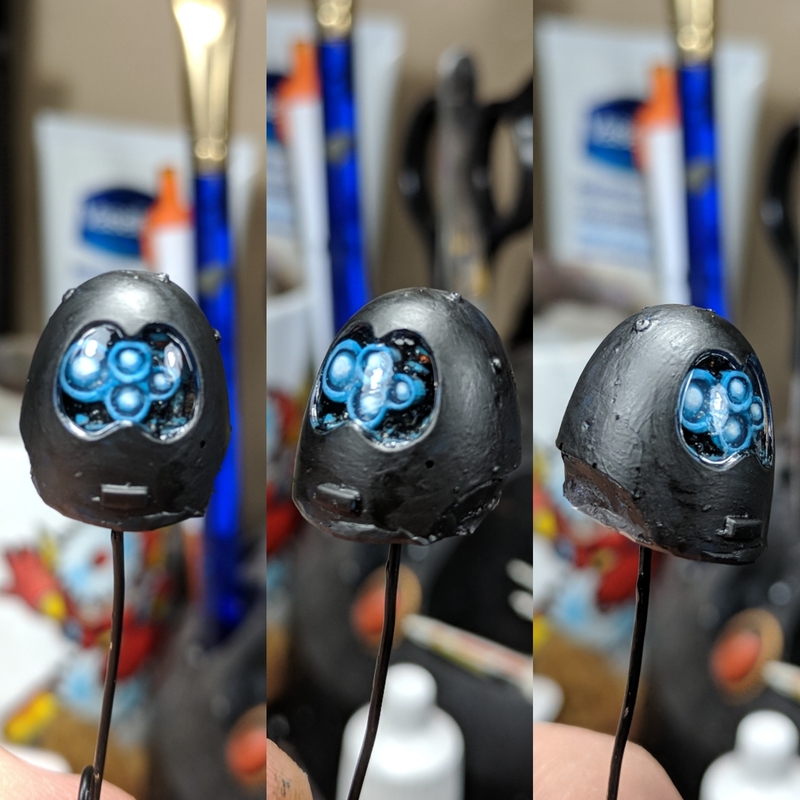 I decided to paint each of their eyes a different color to give them a bit of individuality. An idea that I plan to do with the unhelmed ones as well, which will give me two robots with each color eyes. The eyes came out nice too and I plan to do a tutorial on it soon, in case any one is interested. 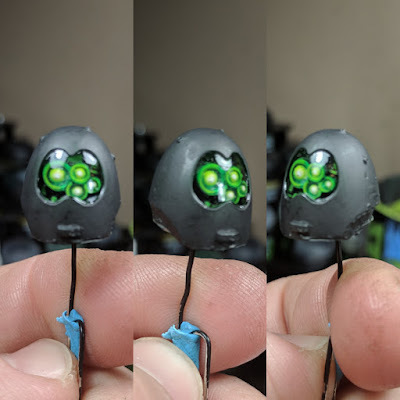 During testing, I ran into a few issues with the eyes gathering air bubbles. To counteract this, I covered the eye areas with 'ardcoat and filled them the best that I could. The idea being that is the recess is filled with gloss coat already, there wouldn't be anywhere for the air to gather. It ended up working out really well too! 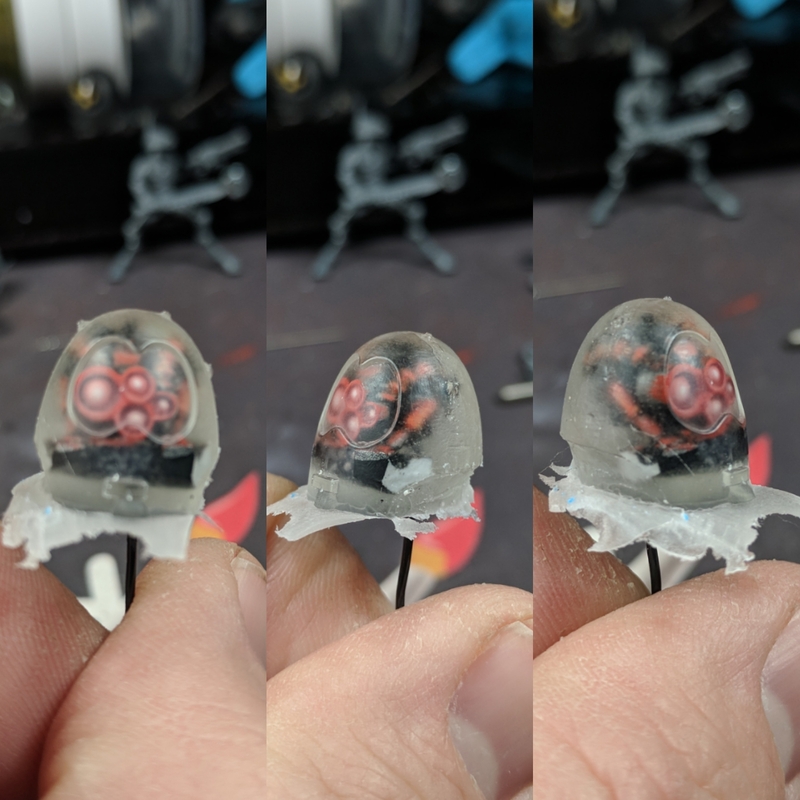 of the 3 heads that are finished, I have no bubbles in the eyes at all. Lining them up proved to be a challenge though, as the only one that came out perfectly centered was the green one. You see, the only way to ensure that I could get them where I needed them to be was to bump the front collar of the Grim Skull head against the ridge for the indent of the glass lens in the face of the helmet. This was a bit more challenging, because of the helping hands I was using to hold everything in place. The just didn't like holding the paper clips and they liked to lift up a bit from the position I wanted them. But overall I am super pleased with the results, even if they aren't perfectly centered. At a glance you'll never really notice. Especially once they are on the table. I'm currently casting the final head, but I am slightly worried about it not turning out. it was giving me an especially difficult time while I was trying to line everything up, and it shifted in the mold too. The plan for painting them is to assemble the bodies without the front chest plate in place and then once the robot is nearly done add the head and the front chest plate. This way, I don't have to worry about accidentally hitting the lenses, or having to mask them. This has been a great challenge so far and they are really shaping up well. 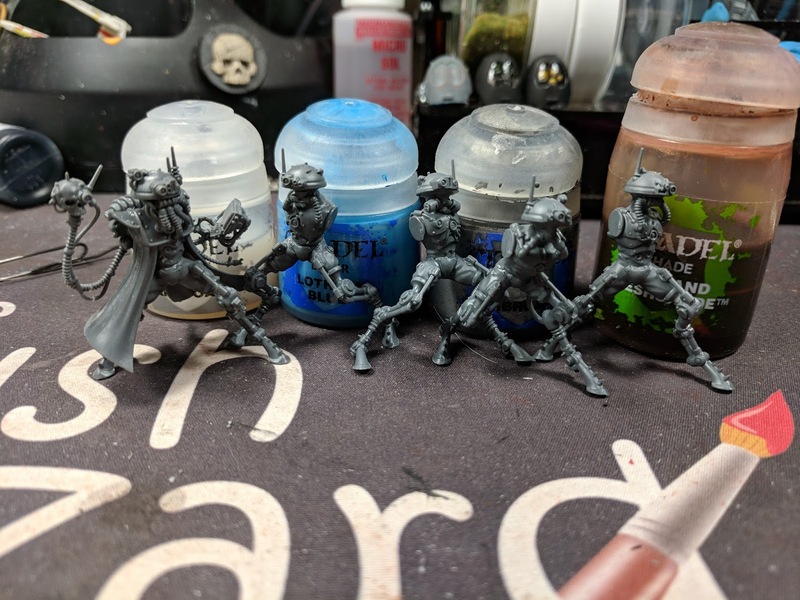 I can't wait to get them fully assembled and on the table! That's it for now, check back next week for another Wizardry in Progress update. But until then, you can catch everything that is happening on a daily basis on Twitter, Instagram and watch me hobby live on Twitch with Hobbyistgirl on Monday and Thursday nights at 8pm est.